Loughgall manager Dean Smith said the club's famous Irish Cup win over Glenavon was recognition of the hard work and dedication of those behind the scenes at Lakeview Park. Looking forward to a semi-final game, a delighted Smith said, “This is fantastic recognition for our football club. The players obviously put in a tremendous amount of effort but this was for everybody behind the so hard off the pitch. “For us it was all about trying to stamp our authority and play our game – we like to get it on the deck and thankfully today it worked,” he said. “I I didn't even watch the penalty, so didn't know if he missed or it was saved. But we scored at a great time straight after it and then grabbed the second one at the right time again. Our defending at times was fantastic at times too. Dale Montgomery, who scored the first goal, is hoping that the result can lead to bigger and better things for the club. 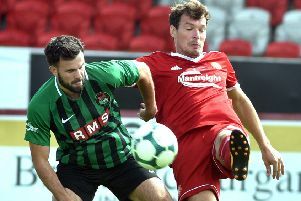 The 27-year-old right back played in the Premiership for Glenavon and he would love a return to the top division with the Lakeview Park club.